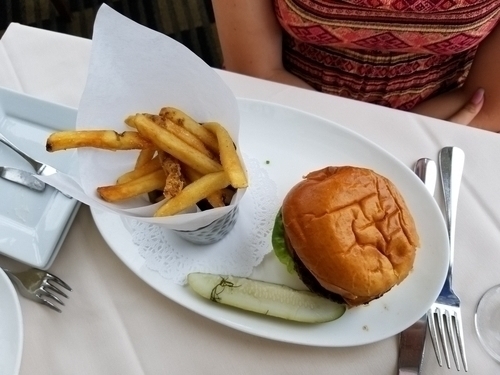 06.19.18 On a recent trip to Boston we checked out the outdoor chess scene, took in the sights, and, of course, sampled the local cuisine. 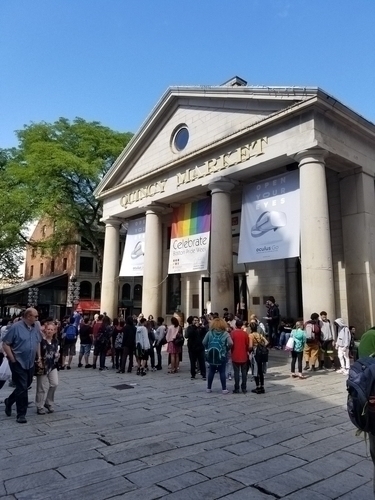 From Harvard Square to Quincy Market and all points in between, here's an illustrated report of what we came across. The lights of Copley Square in downtown Boston shimmer in the nighttime. 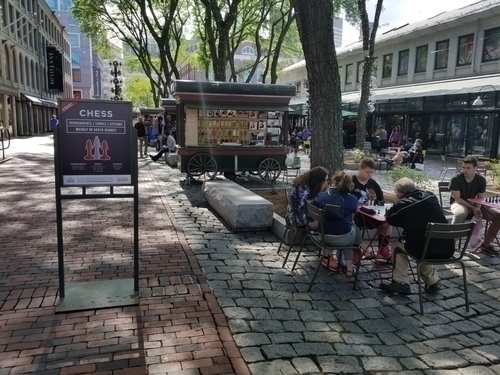 The outdoor chess scene in Boston centers around four primary locations: Harvard Square, Quincy Market, South Station and Christopher Columbus Park in the North End. 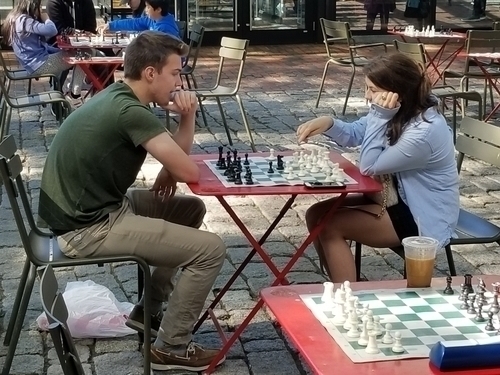 Sadly, the famous chess scene in front of Au Bon Pain in Harvard Square is no more--but never fear! 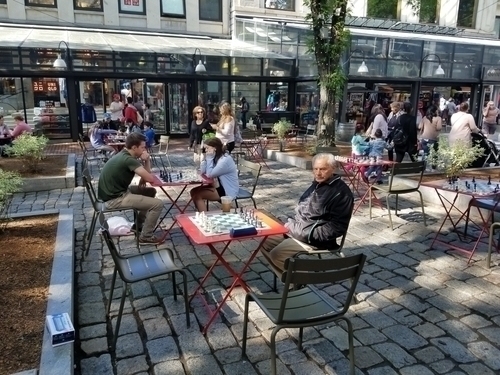 The new Smith Campus Center at Harvard University will transform Forbes Plaza--home of the epicenter of outdoor chess in Boston for many decades--into a vibrant city square replete with five outdoor and five indoor chess tables. The Center is still under construction and is scheduled to be opened in September 2018. 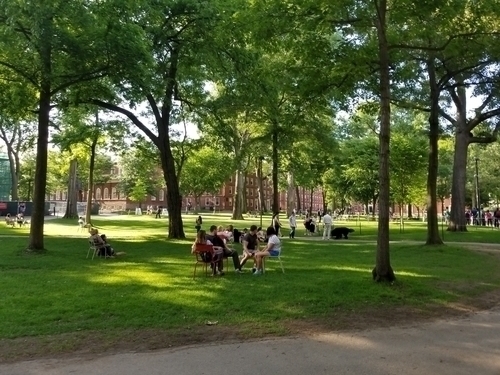 For now, the outdoor Harvard chess scene has been moved to the brick plaza just behind the Harvard MBTA stop. 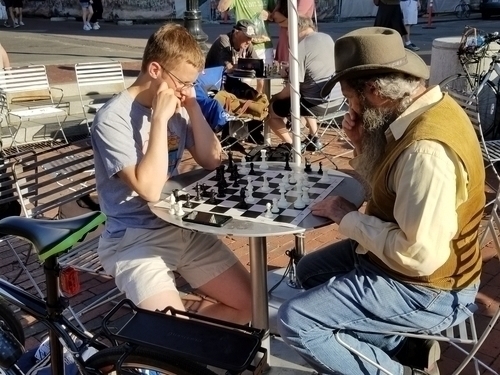 It's not ideal as there is automobile traffic on three sides of the plaza and there are no trees to cast welcoming shade on hot, sunny days but players are hopeful and anticipating their new chess-playing digs across the street. 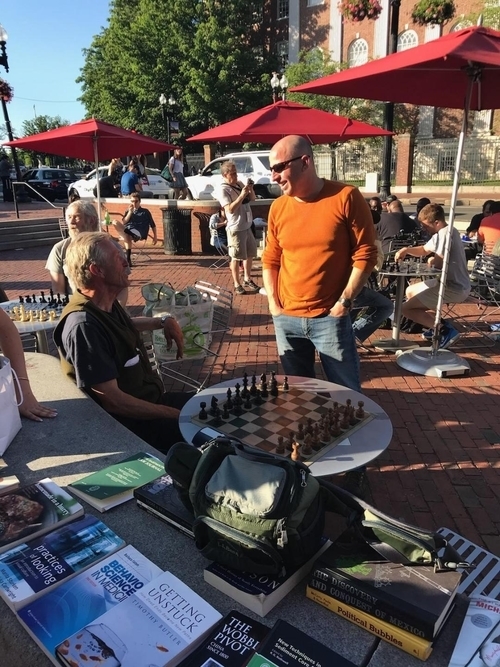 GM Larry Christiansen and others from the Boylston Chess Club are doing their best to promote chess outdoors and in the public eye in Boston. 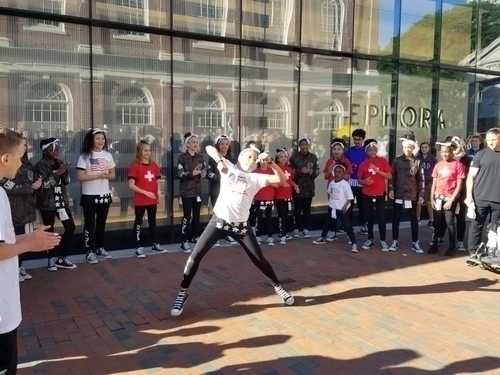 To that end, they are offering free tournaments, simuls, and lessons in both South Market at Quincy Market and at South Station. 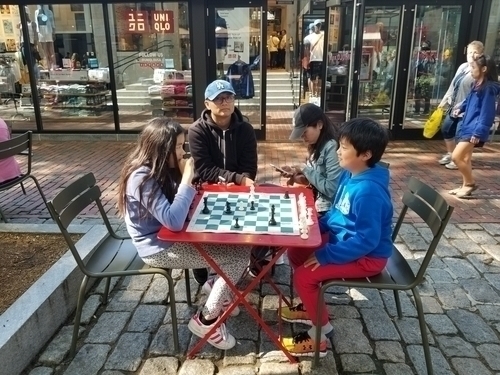 While we were at Quincy Market, there were four games going on with much interest from curious onlookers. The other spot in Boston where you can find outdoor chess happening is at Christopher Columbus Park in the North End. 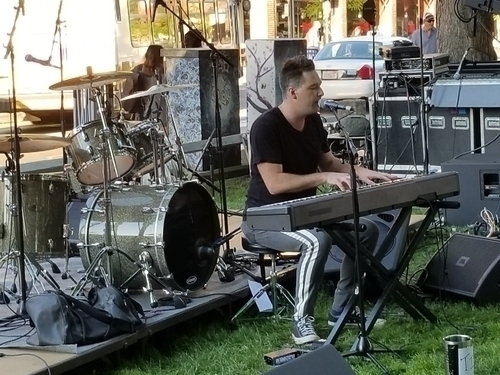 Although a bit off the radar, the park is a beautiful spot to hang out and play chess amongst gardens, a performance area, and children's playground. Forbes Plaza is still a construction site but come back this fall to play chess on the new indoor and outdoor chess tables. 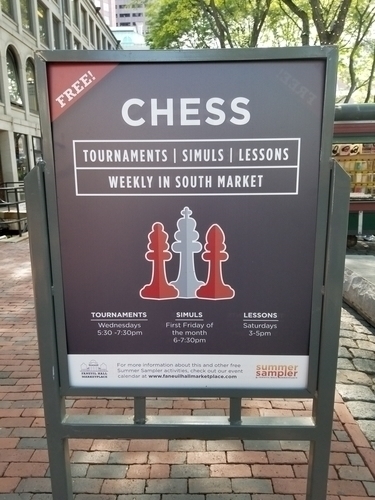 Just behind this street-level entrance to the Harvard MBTA station is the temporary Harvard outdoor chess scene. 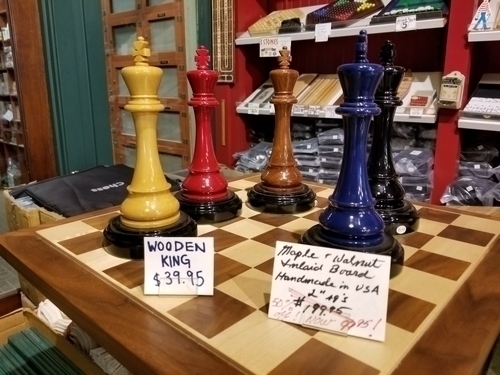 Street musicians serenade chess players and visitors. 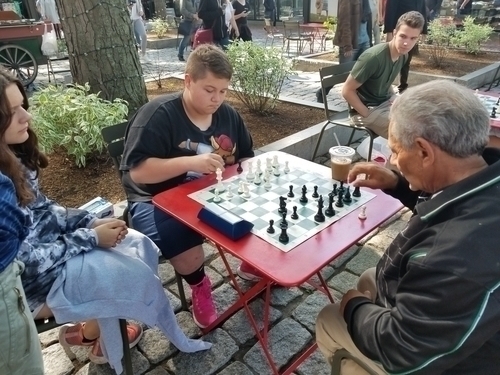 The famous Harvard Square chess master Murray Turnbull hasn't been seen lately around the square but there are many others out there to take his place. 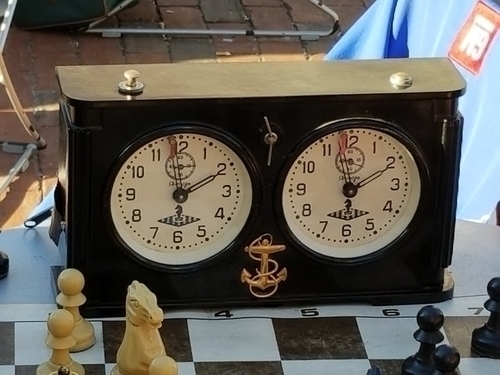 Check out this old school Russian analog clock. After getting soundly trounced by some of the local talent, we shared a few laughs during the post-mortem. Just steps from Forbes Plaza is Leavitt and Peirce. 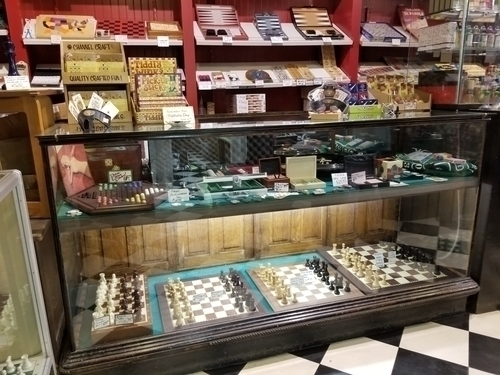 Where one can find fine tobaccos, and chess sets. 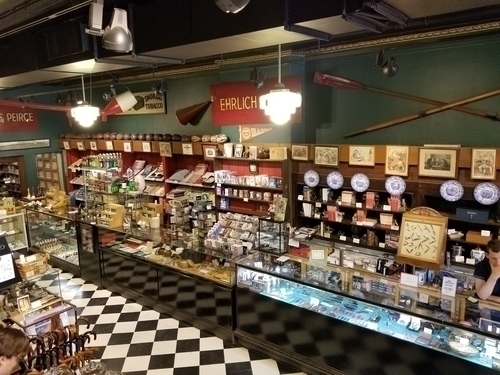 The store carries a nice supply of practical sets. 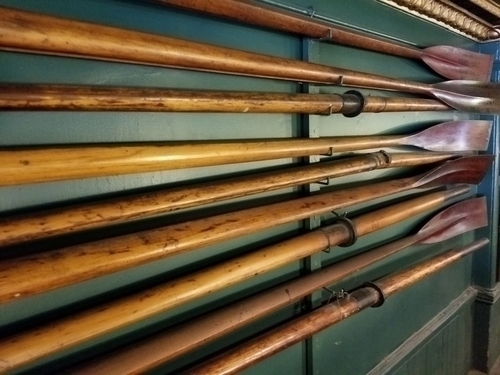 And something for the player looking for a more aesthetically pleasing set. 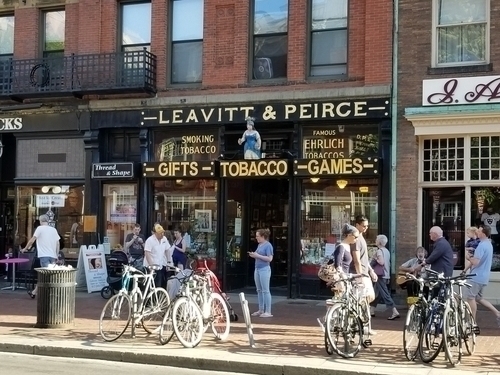 For $2 an hour, players can enjoy games upstairs at Leavitt and Peirce. 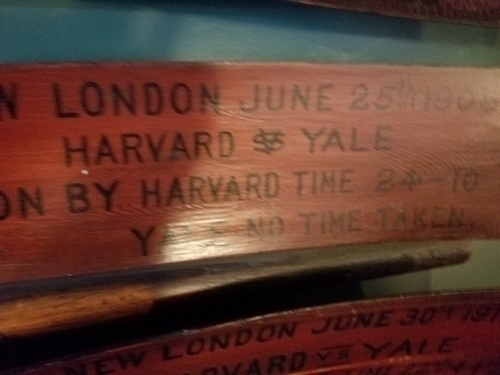 While enjoying some of Harvard's historical memorabilia. 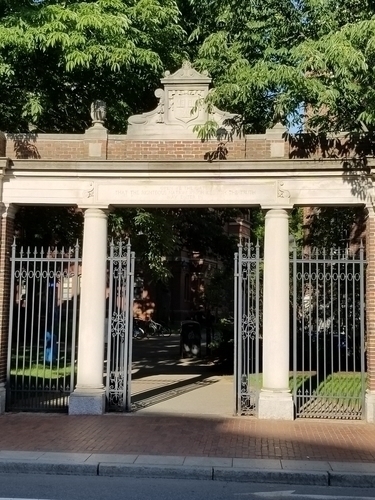 Across the street from Leavitte and Peirce is Harvard Yard. 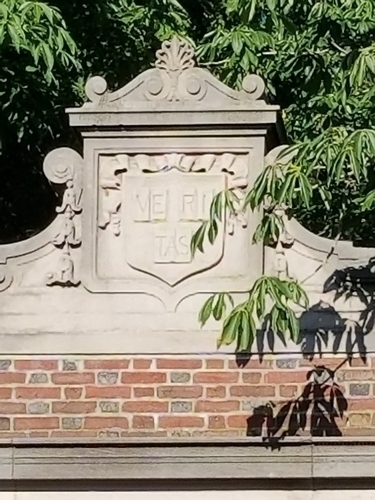 Harvard's motto is veritas: truth. 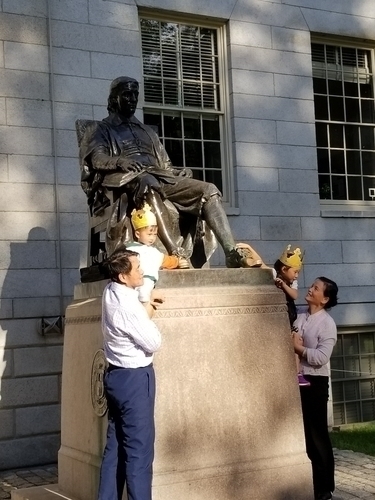 The statute of John Harvard in the center of Harvard Yard is a big draw for tourists from around the world. A closer look at the statue of Harvard University's founding father. 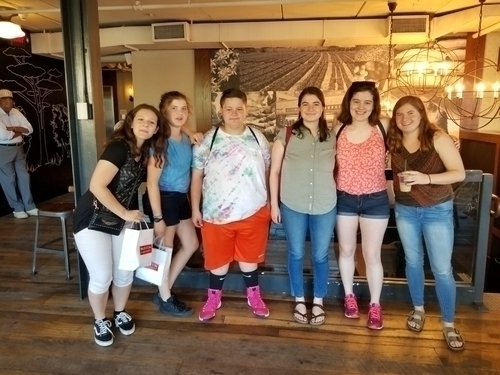 At the Harvard Square Starbucks we ran into this cadre of Maine scholastic chess players! Coincidence? I think not! 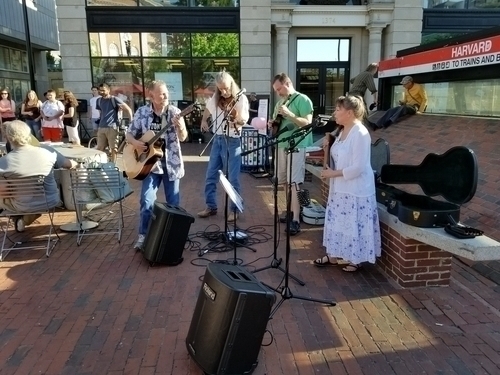 After listening to some more cool sounds on the green we headed out to get some eats. 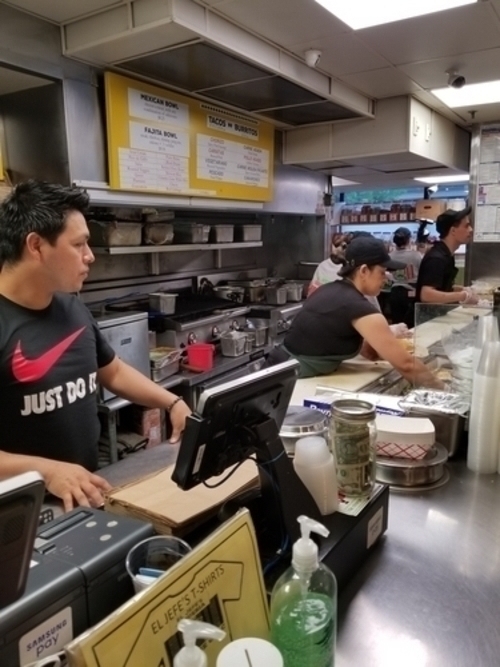 For authentic Mexican in Harvard Square you can't beat El Jefe's Taqueria. Great Mexican food for very reasonable prices! 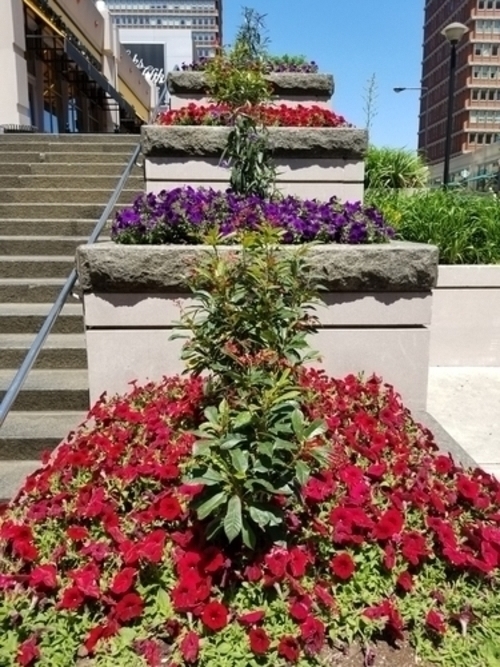 The city was celebrating LGBTQ Pride Month. 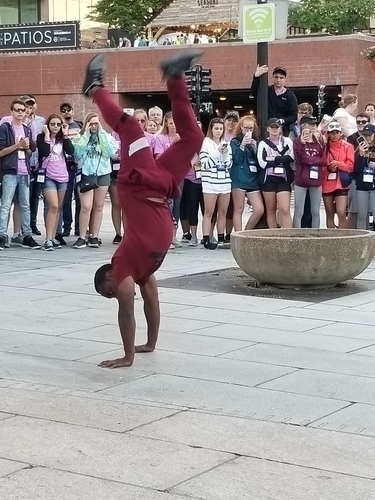 Quincy Market in summer is a beehive of activity with all kinds of street performers. And a budding outdoor chess scene. 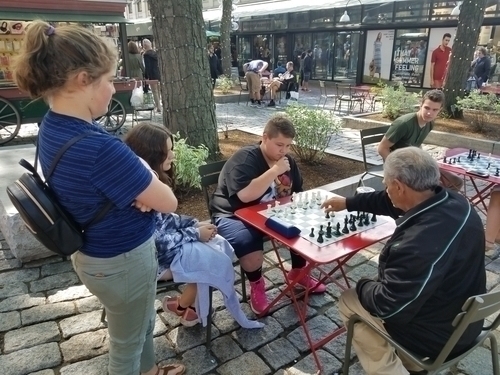 Thanks to the Boylston Chess Club, chess is making inroads amongst the Quincy Market crowd. 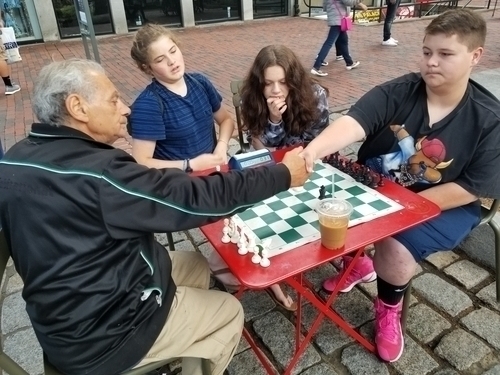 Boylston Chess Club member George holds court at the outdoor tables in Quincy Market. We sicked one of Maine's best K-8 players on him to see what he could do. In the end, the old guard had to resign with some encouraging words for the kid, "Keep playing chess. You've got talent." 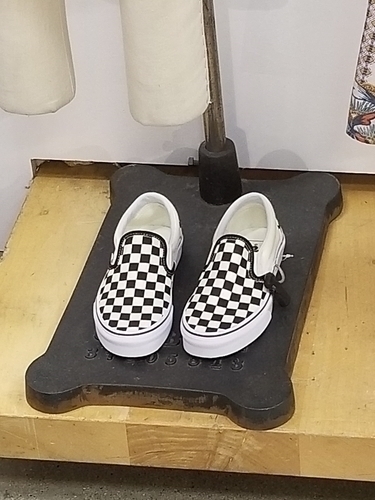 The chess tables at Quincy Market are just outside the hip clothing store Urban Outfitters where we found some tournament appropriate garb! 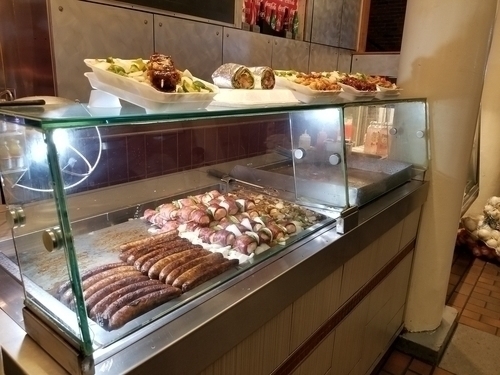 There is no shortage of great food inside the main marketplace. 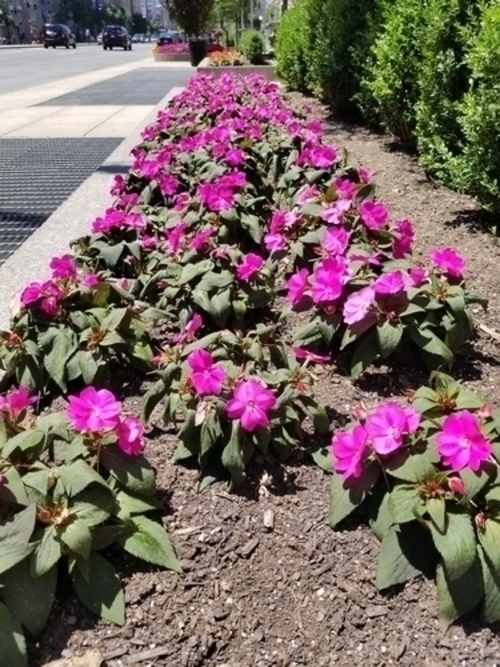 As the summer solstice approached, Boson was alive with color. 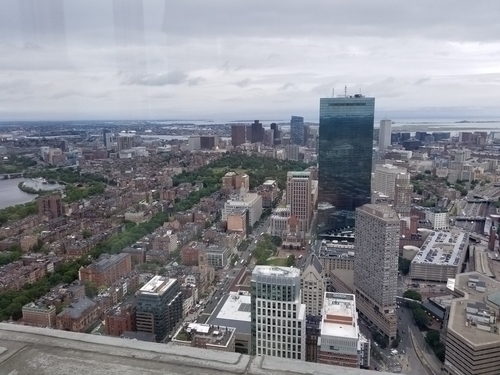 Back at Copley Square we took the elevator to the Top of the Hub. 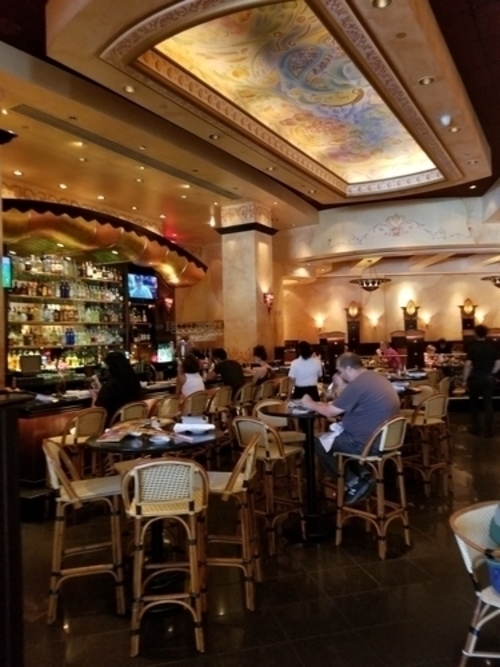 A restaurant on the fifty-second floor of the Prudential Center. 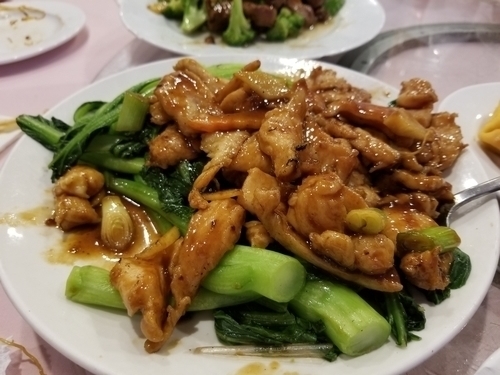 as well as some great Boston Fare! 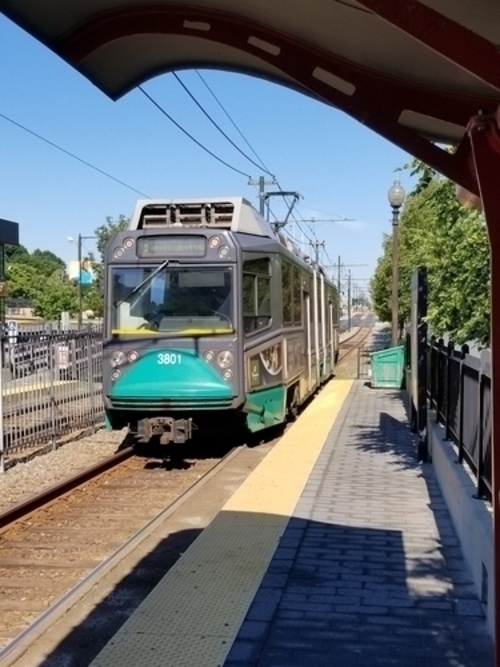 For getting around Boston on the cheap ride the MBTA; it's fast, convenient, and easy. 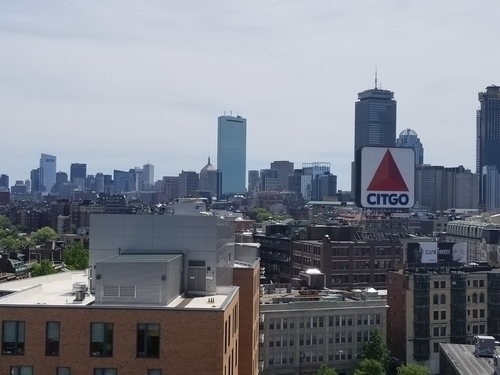 We took the "T" up to Boston University Central and had a first-class roof-top tour of the campus from a representative of the Dean of Students Office. 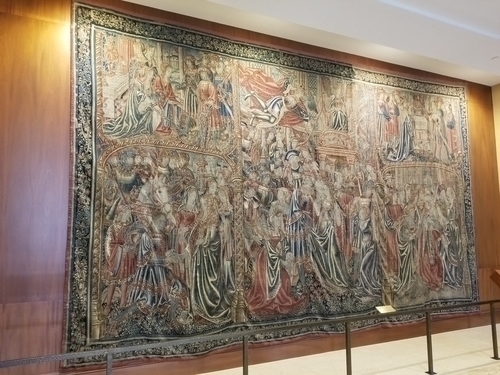 This beautiful late gothic/early renaissance Flemish tapestry titled The Knight's Vow, on display in Boston University's Questrom School of Business, dates back to circa 1500. 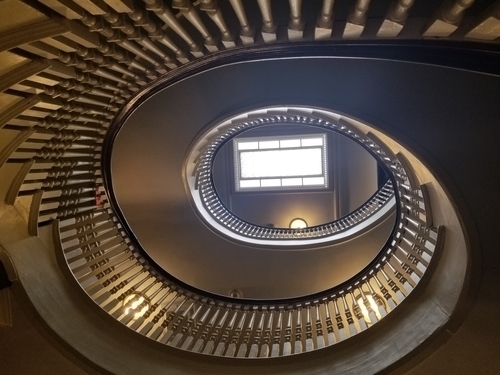 A spiral staircase in one of the University's student residences on Bay State Road. 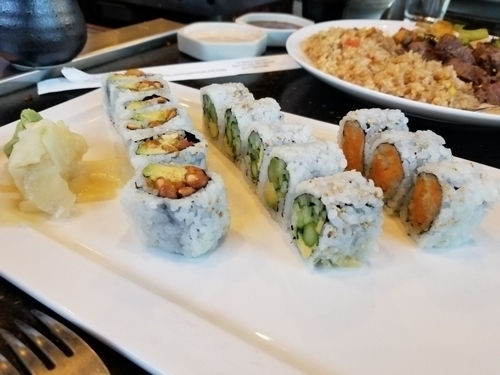 After a long day of touring the city we hit Osaka Restaurant in Brookline. The life of a chess correspondent is tough but someone has to do it! 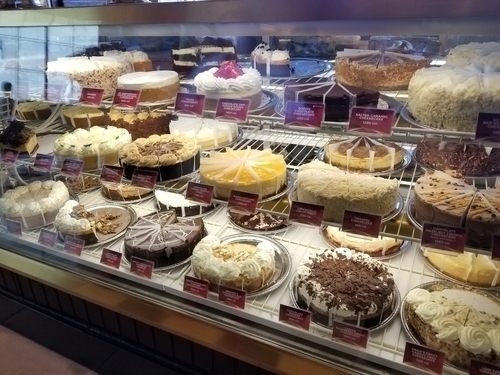 In our humble opinion, no trip to Boston is complete without a trip to...The Cheesecake Factory! 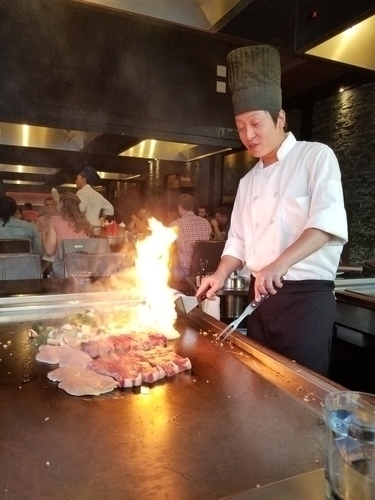 Which also is a full-service restaurant and bar. 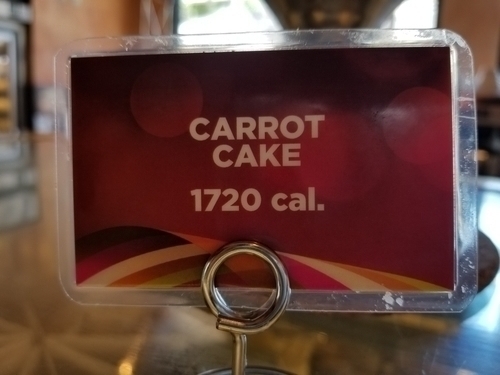 That's per slice but who's counting?! 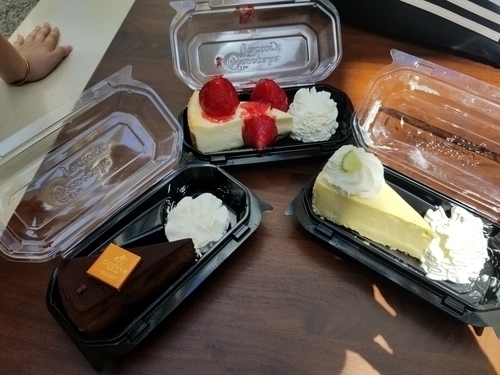 A small sampling of some great cheesecake! 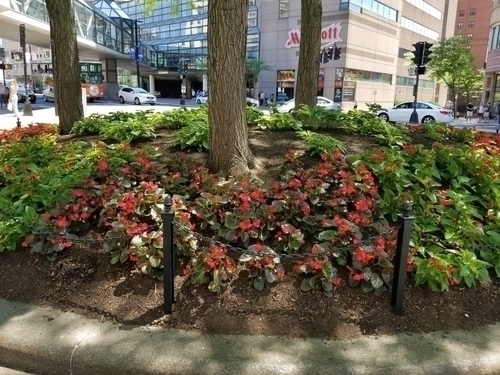 One very pleasant thing about Boston is the emphasis on green public spaces. 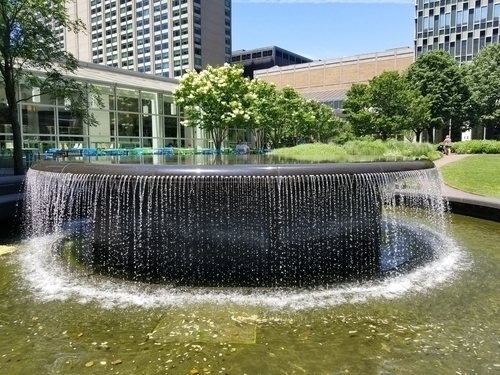 We had a enjoyable lunch in view of this beautiful fountain. 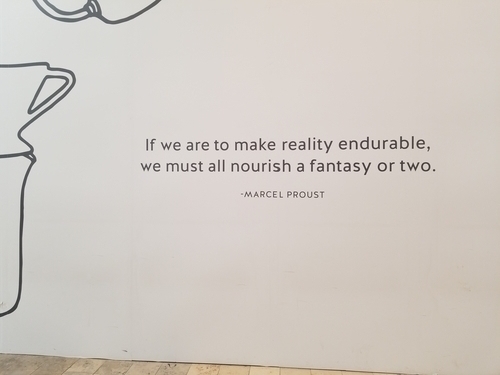 This Marcel Proust quote in the Prudential Center reminded us of a member of the chess playing literati Jorge Luis Borges who, writes Carlos Colodro, was a detractor of the novel. He exclusively wrote essays, poetry and short stories, focusing on topics of universal nature. 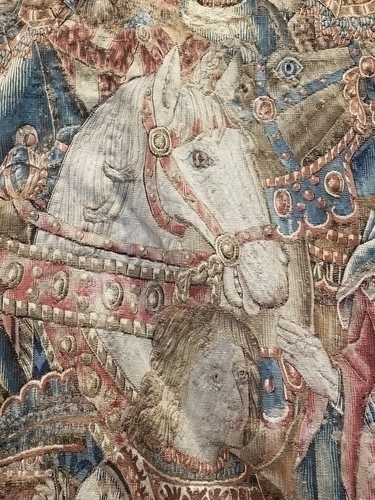 To present the worlds that inhabited his mind, he saw it necessary to use fantasy, and within this literary framework, he found in chess a useful metaphorical tool. 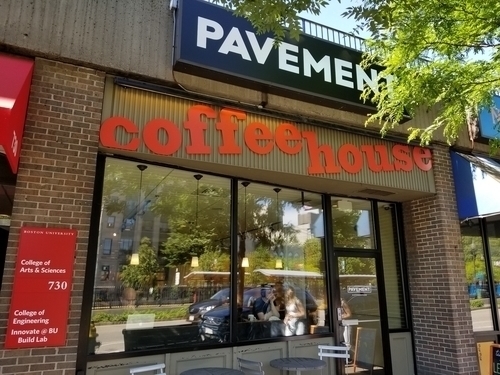 If your are looking for the best coffee in Boston, ditch Starbucks and head to the Pavement Coffeehouse on Commonwealth Avenue. 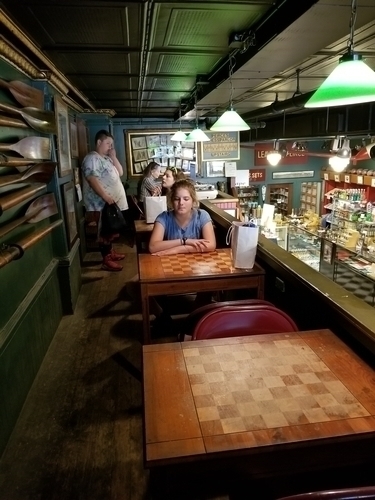 A cool place to get some great java, breakfast, and play some chess! Until next time all! Nice pictures & story, I was also struck by the coincidence of being reminded twice in one day of my time in the Boston area. It was good to have Prof. Irons at the MIT lunch meeting, as his sharp eye /ear for numbers kept some inaccuracies in the STEM presentation from spreading. I always love your trips and appreciate your letting us share in your adventures. 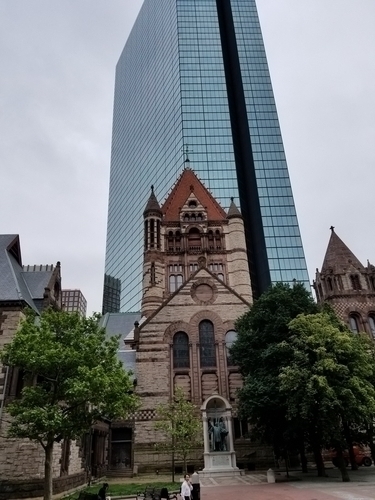 It was wonderful to see so many magnificent Boston scenes to bring back memories of my MIT experience there of over 60 years ago. 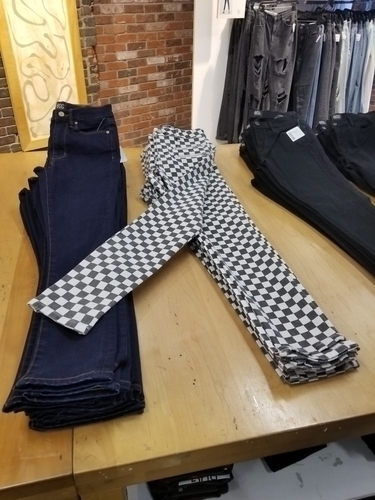 Also today I made a round trip, from Orono to Falmouth, for the purpose of meeting with tie MIT Club of Maine...and was pleased to meet MIT alum and Maine chess fan, Barry Magda, who was also there. That's a lot of coincidence, for me, in one day. Thanks for the great synchronicity.